It was a trip to Thailand where I first fell in love with Thai soups. God how I loved them. The hot and sour soups, the red curries, the green curries, the sweet yellow (also called massaman) curries, all swimming in scents of fresh lemongrass, ginger, Thai basil and fish sauce. Because they were made fresh every day with local ingredients, no two bowls of soup ever tasted the same. And because of that every meal for the entire four months of my trip had a little tinge of excitement. “What is THIS ONE going to taste like?” I would think to myself while waiting in eager anticipation for the meal to arrive. 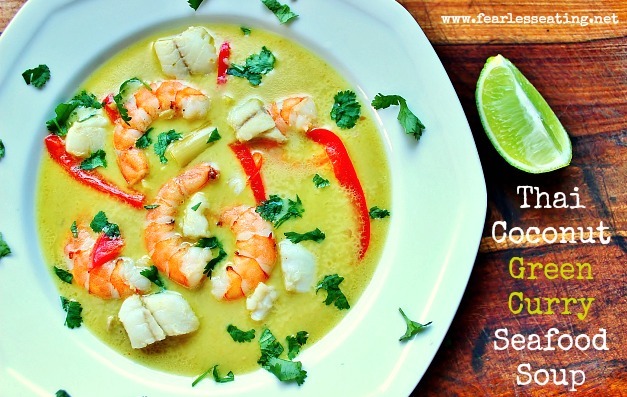 And this Thai coconut green curry seafood soup one was one of my favorites. Now there are a kazillion variations depending where you are in the country and what’s in season. Even here in America you’ll see some version of it on almost every menu in every Thai restaurant. This recipe is also included in my new book, Fearless Broths and Soups, many of which are Asian-themed. 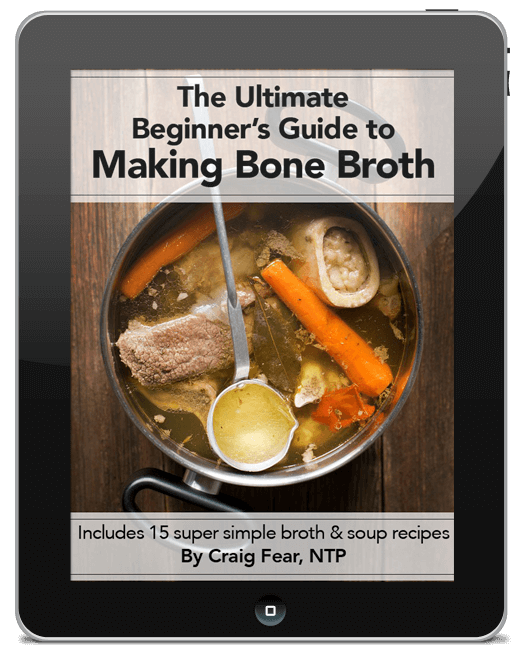 It is part of the “Soups from the Sea” chapter which features soups made with fish broth. What I strive to do with all the recipes is to show you how you can improvise different variations depending on what you like. And this recipe is ripe for variation! Any type of seafood can be used. Use whatever you want. Similarly, play around with the ratio of fish broth to coconut milk. I find a 1:1 ratio is pretty good but sometimes prefer more of a coconut flavor and I’ll add less fish broth. Sometimes you need to experiment to find what you like! Finally, just a warning. Green curry is often very spicy so add only a small amount to start. Adding a little organic sugar at the end can help balance the spice. You can also substitute another less spicy Thai curry such as a red curry paste or a yellow curry paste. Most American health food stores now carry a few types of Thai curry pastes such as Thai Kitchen and Maesri. A simple blend of Thai green curry paste, coconut milk, veggies and seafood, seasoned with fish sauce, lime juice and herbs. Add coconut milk and fish broth, bring to a boil, reduce heat and simmer about 5 minutes. Remove about ½ cup of liquid and mix in curry paste. Start with a small amount, about a teaspoon, mix back into soup and taste. If more spice is desired, add more curry paste in same manner. Once you have your desired spiciness, do the same thing with the sugar, adding it in slowly to get your desired sweetness. Add red pepper, shrimp and fish and simmer until shrimp and fish is cooked. Season to taste with lime, cilantro and fish sauce or soy sauce. 1. If you’re unfamiliar with lemongrass, it’s a tropical plant with a lemony scent and flavor that is very common in southeast Asian cuisine. Don’t eat it! It’s just added for flavor. Strain out the pieces or just pick them out as you go (which is what I do). Many stores in America now carry it. 2. Use any seafood you like with, or in place of, shrimp and fish. 3. Add in some broccoli florets or string beans with the red peppers. If you like the red peppers more cooked, add them in step 1. I prefer more of a crunch and prefer to add them in step 3. 4. Add rice noodles and make it an Asian noodle soup. Get More Asian Soup Recipes! 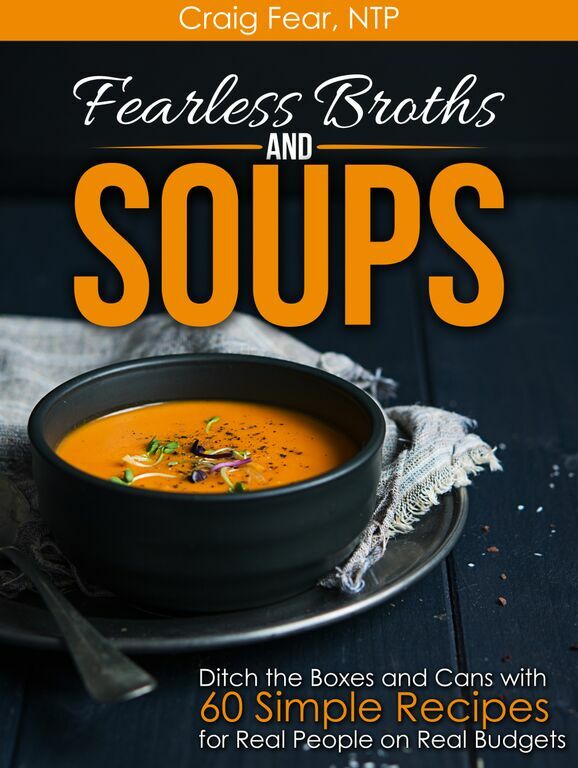 My new book, Fearless Broths and Soups, includes many other Asian seafood soups as well as entire chapter devoted to Asian noodle soups (my favorite chapter)!